I visited the Hunt Museum in Limerick this week for the first time. I have passed it many times since I moved here, but I wanted a few hours to look around the museum rather than racing quickly through its exhibits and displays. There are many items in the museum that I hope to return to, including a chalice and paten from Saint Mary’s Church, Askeaton, and a replica of the Ardagh Chalice, which was found within this group of parishes in west Limerick. But I was particularly interested on Thursday to come a across a 15th century English processional cross which bears an uncanny and remarkable resemblance to the ‘Bosworth Crucifix,’ which once belonged to the Victorian book collector and antiquarian James Comerford (1807-1881). The ‘Bosworth Crucifix’ now belongs to the Society of Antiquaries in London, and featured prominently in the exhibition ‘Making History’ (2008-2009). The processional cross in the Hunt Museum, which is dated ca 1450, is made of bronze (the labelling in the display cabinet says gilt copper alloy) and is mounted on a modern wooden base. The outline of the cross is decorated with projecting splays of leaves and terminates in circular medallions, each bearing symbols of three of the four evangelists – Saint Mark, Saint Luke and Saint John; the medallion depicting Saint Matthew is missing at the base. The cross bears geometric engraving on the front and the back, with the back of each medallion engraved with a Tudor rose. Two empty sockets at the base of the cross may have carried figures of the mourning Virgin Mary and Saint John the Evangelist. Processional and altar crosses of this type were made in large numbers and were exported from England. There are numerous examples from Ireland, and the finest example is said to be the Ballylongford Cross, made in 1479. The Bosworth Crucifix, which is similar in almost every detail, also dates from the mid-15th century, and is said to have been discovered around 1778 at or near the site of Battle of Bosworth. This 15th-century bronze processional crucifix measures 58.5 cm x 28 cm (23 in x 11 in). It is made of bronze alloy and would have been originally overlaid with gold. It has an outer frame forming a foliated border, damaged at each extremity of the transverse limb of the cross. At its centre is the figure of the Crucified Christ, crudely cast in a bronze alloy. A mark at the crown of the head indicates that a nimbus was once attached to Christ’s head. Like the cross in the Hunt Museum, additional branches on the Bosworth Crucifix may have carried figures of the Virgin Mary and Saint John. Attachments for these additional branches can be seen at the base of the cross, although the branches themselves are now missing. Philip Schwyzer suggests in Shakespeare and the remains of Richard III (Oxford University Press, 2013) that the cross belonged to a travelling chapel royal, and that it was lost and abandoned in the chaos after the battle. Chris Skidmore, in Bosworth: the Birth of the Tudors (Hachette, 2013) suggests the crucifix was used during a private Mass for Richard III before the Battle of Bosworth. After that Mass, the cross would have been taken off its base, mounted upon a wooden stave, and fastened into place by a hinged ring of iron to be led into the field of battle. In his paper on ‘The Bosworth Crucifix’ in the Transactions of the Leicestershire Archaeological and Historical Society (no 78, 2004), John Ashdown-Hill, who specialises in the life of Richard III, wonders whether this Lady Fortescue may have been Lady Barbara Talbot who in 1780 married Francis Fortescue-Turville of the Manor of Husbands Bosworth. She was a sister of Charles Talbot (1753-1827), 15th Earl of Shrewsbury (1787-1827), and aunt of John Talbot (1791–1852), 16th Earl of Shrewsbury (1827-1852) and patron of the Gothic revival architect AWM Pugin. Lady Fortescue, or Lady Barbara Fortescue-Turville, was originally from Hoar Cross, Yoxall, about 12 km north of Lichfield and 30 km north of the Bosworth battlefield. She is said to have given the crucifix to one of her workers, John Brown, who owned the crucifix when he died in 1791 ... perhaps the same John Brown of Kenilworth whose will was proved in the Consistory Court of Lichfield in 1793, although his will does not mention the crucifix. The crucifix and many other Catholic relics passed from John Brown to Joseph Carter, the sexton of Saint Michael’s Church, Coventry (later Coventry Cathedral) by 1793. This Joseph Carter had married Elizabeth Brown in Saint Michael’s Church, Coventry, in 1778, and she may have been related to John Brown. He died in June 1808, and his will was granted administration in the Consistory Court of the Diocese of Lichfield on 7 October 1808. The crucifix then passed to his widow, Elizabeth Carter, and remained with the Carter family of Saint Michael’s Parish, Coventry, and presumably it was she who sold it to the Comerford family – probably James Comerford’s father – ca 1808-1810. However, it is still unclear how the crucifix passed from the Brown family to the Carter family and from the Carter family to the Comerford family. James Comerford first practised as a notary public in partnership with TS Girdler as Comerford and Company at 27 Change Alley, Cornhill, London, from December 1827. Later, he practised from 7 Tokenhouse Yard, Lothbury, London. He was also a magistrate or Justice of the Peace (JP). In 1833, James Comerford was secretary to the Society of Public Notaries of London. In December 1840, he was elected a Fellow of the Society of Antiquarians (FSA). Between 1841 and 1851, James Comerford and his family were living at No 7 Saint Andrew’s Place, Regent’s Park, London. By 1872, he was living in Framfield, Sussex. He died on 8 March 1881. His son James W. Comerford shared many of his antiquarian interests. The processional cross in the Hunt Museum was bought at auction in Christies in 1961 by John Hunt for £130. Dr Colum Hourihane of Princeton University attributed it to Ireland, ca 1460-1480, and says it was possibly made for a Dominican foundation. He identified it with two other crosses by the same maker, one in Multyfarnham and the other in the National Museum of Ireland, from a Dominican foundation in Sligo. 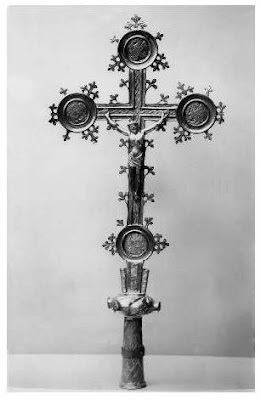 Nevertheless, the similarity of this cross with James Comerford’s ‘Bosworth Crucifix’ is so striking it would be interesting to know how Dr Hourihane came to his conclusions 20 years ago, and how the Limerick Cross came to be sold by Christies in the 1960s.